Almost any effective CSO mitigation plan that the city can possibly come up with will involve the creation of large multi-billion dollar retaining tanks and force our water/sewer rates to skyrocket. So here comes our out of the box thinking: How can we mitigate the negative effects of CSO without spending billions of dollars restructuring our sewer system? The Citizens Action Committee (CAC), made up of industry experts, recommended that the city use water and sewer rates to incentivize owners to retain water on site. Currently, New York property owners do not pay to dump stormwater but by levying such charges the city can effectively incentivize owners to retain water on site and eliminate CSO occurrences, as the CAC recommended. More importantly, the administrative costs to the city would be minuscule compared to the billions that would be spent building huge tanks. As a bonus, on site retention can also have other environmental benefits (for example, green roofs mitigate the effects of urban heat island). The City’s current water rate structure is comprised of a charge for consumption of water and an additional 159 percent for all sewer, stormwater, and wastewater services. Because this rate structure fails to reflect the true costs of stormwater generation and can lead to distortions, the City is currently undertaking a yearlong study to consider improvements. The City is analyzing its current expenditures, reviewing the rate and credit programs of other municipal water systems, and estimating the impacts of alternative stormwater rate structures on ratepayers and revenues. This effort will be coordinated with other ongoing efforts to map impervious areas in the City and to overhaul the program for water bills. The “yearlong study to consider improvements” that the plan refers to is Booz Allen Hamilton’s (BAH) rate study, the results of which were released last week. (You may remember BAH from many of the other studies they performed for the DEP in the past. They are, after all, the DEP’s favorite go-to accounting firm when using the Water Board to bypass the contract bidding process.) The first thing worth mentioning is that this “yearlong study” took more than a year. Shocker. But that’s not as important as the results. So let’s look at the results. The DEP paid BAH over a million dollars to “[analyze] its current expenditures, [review] the rate and credit programs of other municipal water systems, and [estimate] the impacts of alternative stormwater rate structures on ratepayers and revenues.” I would have thought that BAH would calculate the administrative costs involved and the feasibility of enacting a stormwater fee. Then they would project the savings as a result of on site stormwater retention and avoidance of the creation of stormwater retention facilities. I expected graphs indicating the relationship between the different possible stormwater rates and expected consumer response. (If we charge 5% of the water rate we need $2 million to implement the program but it’ll take us 20 years to recover that two million. If we charge 30% of the water rate we need $2 million to implement the program and we’ll recover the costs in less than a year. Something like that.) In short, how large (or small) a fee would you have to implement to start seeing a savings. What BAH did instead was what every college student does when the deadline is up and they haven’t done any of their work. They reiterated the question. Don’t get me wrong–they did it well. They included five pages of meaningless charts (fancy, but meaningless) showing which cities use which rate structures. But they didn’t address the crux of the problem. There is nothing in the report about the effectiveness of such a program, what it would cost the DEP to implement it and how much can be saved by stormwater avoidance. The only thing BAH actually put forth in their conclusions (slide 30 of this presentation) is the following: “New billing system must be in place in order to fully implement a City-wide stormwater rate structure and credit program.” It’s subtle. Did you catch it? It sounds to me like BAH’s pitch to sell the DEP a new rate program, one that would no doubt take another few years and another few million dollars. We strongly urge the City to include in the Plan a firm commitment to restructure the water rates to implement a separate stormwater fee, varying based on the imperviousness of a site, as soon as possible. We understand that a rate restructuring study is now underway and urge that the consultants conducting that study be asked not whether a separate stormwater fee is practicable – because we know it is, based on the experience of many jurisdictions around the country – but rather how to implement such a fee structure in New York City as soon as possible. Again, special thanks to the good folks at SWIM for fighting for this one. We’ve even heard DEP Deputy Commissioner of Environmental Planning and Analysis Angela Licata advocating for stormwater fees at a few Water Board hearings. Categories: Combined Sewer Overflow, DEP, Water Board | Tags: angela licata, booz allen hamilton, environmental entrepreneurs, nyc dep, nyc water board, nyc water rate, stromwater management, SWIM | Permalink. Like most older sewage systems, New York City’s sewage system is what’s known as a “combined sewer system.” This means that the system was never built to accommodate clean rainwater and dirty wastewater separately and therefore, when it rains, the clean rainwater is dumped into the sewer outfalls together with our dirty wastewater. Top: Combined Sewer System. Bottom: Separate Sewer System. In the image above you can see a perfect example of how NYC’s older sewer system (top) differs from newer, “separate sewer systems” (bottom). As you see, during dry weather, all that happens in both cases is that wastewater goes to the publicly owned treatment works (POTW). But when it rains, new systems keep the wastewater and rainwater separate and send only the wastewater to the POTW while the clean rainwater goes to the river. In NYC, when it rains, a mix of rainwater and wastewater goes to both the POTW and to the river. As a result, after heavy rains our sewer outfalls often experience what is called a “combined sewer overflow” or CSO. During a CSO it is dangerous to boat, swim, fish or conduct countless other activities around the heavily polluted water. The existence of CSOs is in itself a problem that the DEP has to deal with. But it is a problem that will take years and years and billions and billions of dollars. What can we do to mitigate the dangers of CSOs right now? The answer is better CSO notification procedures. 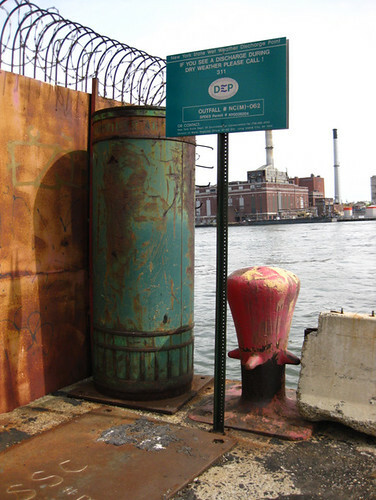 NYC currently has about 500 CSO outfalls according to the New York Water Environmental Association. In 1999, the city began putting signs up at their CSO sites like this one at Wallabout Bay. The signs say “IF YOU SEE A DISCHARGE DURING DRY WEATHER PLEASE CALL! 311.” Now, I ask you: if you hadn’t read the first three paragraphs of this post, would you know what this means? I wrote the first three paragraphs of this post and I’m still not sure what this means! Here’s another problem: If it just rained last night and this afternoon your son or daughter wants to go swimming in, say, Paedergat Basin, how are you supposed to know whether or not they are about to climb into a toxic cesspool? Thanks to pressure from our friends over at SWIM (Storm Water Infrastructure Matters), the DEP (with a little help from HydroQual Environmental Engineers) recently created a web page where you can check on the status of CSO sites around the city. I include a link here so that you can take a look yourself and decide if this is sufficient for a system that has 500 CSO outfalls that your child can be swimming in, that your husband can be fishing in or that the entire family can be taking a boat ride in. We live in an age obsessed with notifications. The federal government requires notifications on every single pack of cigarettes and bottle of alcohol. The mayor requires calorie counts to be posted in every donut shop in NYC. Why are we more concerned with what we put inside our bodies than with what we put our bodies into? A large, easy to read sign near every single CSO outfall into New York that says something to the effect of “IF YOU SEE WATER COMING OUT OF THIS PIPE, DO NOT SWIM HERE. ALL WATER COMING FROM THIS PIPE IS TOXIC AND DANGEROUS TO YOUR HEALTH” is the best way to keep us safe from the unfortunate, unavoidable effects of CSO. Categories: Combined Sewer Overflow, DEP | Tags: Combined Sewer Overflow, hydroqual environmental engineers, SWIM | Permalink. One of the first actions of Mayor Bloomberg’s third term was to appoint Caswell F. Holloway as the new DEP Commissioner. Commissioner Holloway has his hands full. The Water Board is blaming conservation for projected double-digit increases in water/sewer rates. Environmental groups and the New York Times are focusing in on raw sewage in the Hudson River. Gas drilling is about to begin in the watershed and the Delaware Aqueduct may spring a leak at any time! Yet no one is proposing affordable solutions. And so, in the coming weeks, WaterWatchNYC will be rolling out a list of “Ten Ways to Save the DEP,” ten steps that we think the DEP, the Water Board and the Mayor should take in order to save money and the environment. This is not the first time that a Mayor or the Water Board faced daunting challenges. Back when Mayor Dinkins appointed Albert Appleton as the DEP Commissioner in 1990, the agency was beset with problems. NYC was coming out of a Stage III Emergency drought (little did we know that another drought was only a year and a half away), spending was out of control and water and sewer rates were rising at unprecedented levels (from Fiscal Year 1989 to the second half of Fiscal Year 1990, the combined water/sewer rate went up over 40%!). New Yorkers were clamoring for additional sources of water. The federal government was pressuring NYC to begin filtering its drinking water and the environmental lobby was suing the city to build huge sewer treatment plants. He questioned every solution proposed by the DEP’s engineering department and the federal government. When the federal government mandated that NYC start filtering our drinking water, Commissioner Appleton’s priority wasn’t the cheapest and most effective way of building and operating filtration plants. His priority was the cheapest and most effective way of improving the quality of our drinking water. There is a subtle difference here, but that subtle difference is magnified when you examine the actual outcome. Appleton didn’t build a single water treatment facility. He purchased the land around our reservoirs and ensured that from the very first stages of our water delivery system, the water is clean. At a minimal cost, Commissioner Appleton eliminated the need for billions of dollars of spending. Appleton’s solution to the drought was no less courageous. Rather than spend tens of billions of dollars to build new reservoirs, the city spent only $250 million to replace over one million toilets. Now we have more water than we know what to do with. (As of this writing our reservoirs are at 93.6%, over 20% greater than normal.) NYC was told to spend billions and the commissioner said I’ll just prevent this from even becoming an issue and save money in the process. I bring this up in my introduction because Commissioner Appleton and his approach to creative financial and environmental problem solving is a perfect example of what we need to see from the DEP. All the existing problems can be solved on the cheap by daring to think outside the box. We are currently facing many of the same problems that Appleton faced when he took office (out of control spending and consistent double digit rate increases just to name a few). If there’s one thing Commissioner Appleton has taught us it’s that whether the problem is financial or environmental, all it takes to be one step ahead is thinking outside the box and a little creative problem solving. And by the way, when Appleton left office, the DEP was in the middle of a three-year freeze on water/sewer rate hikes. All is not lost. Categories: DEP | Tags: dep rate hikes, Michael Bloomberg, new york times, nyc dep, nyc water board, reservoirs, spending | Permalink. I recently came across a membership request postcard from the Prospect Park Alliance touting the restoration of their beautiful Fallkilll Falls. An interesting piece of trivia about Prospect Park is that its whole water system — lakes, waterfalls, beaches, islands — is entirely man-made. It’s a pretty fantastic feat of engineering (it was designed by Frederick Law Olmsted and Calvert Vaux and its construction began in 1866), but it involves a dirty little secret. 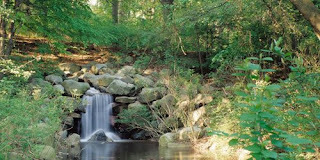 The vast and impressive Prospect Park waterway, including its two pools, its stream through the Ravine, the 60-acre Lake and the Lullwater that connects the Ravine to the Lake, all starts with the waterfall at Fallkill Falls. Have you ever wondered where all the water in Prospect Park Comes from? The answer may surprise you. Since the entire system is man-made, it isn’t a naturally occurring system boosted by rain and other features of Brooklyn’s natural habitat and climate. Instead, the water actually comes from a pipe that has a valve that can be opened or closed, much like the faucet of your kitchen sink. Actually, it’s more like your kitchen sink than you realize: Fallkilll Falls and your kitchen sink actually get their water from the same source. The only difference is that New York City charges you for your water use but they don’t charge Prospect Park. That’s right, the cost of water in New York City has to be high enough to offset the cost of every single drop of water in Prospect Park (and many other parks in the city, for that matter) as well as its strain on NYC’s water infrastructure. Now don’t get me wrong. I’m not advocating cutting off all water to New York City’s parks. New York is a beautiful city and much of it has to do with the beauty of our parks. The water in Prospect Park used to be supplied by a well until it was determined that it would be cheaper to use free water than to maintain the well. But in the end, don’t we all benefit if we can enjoy the beauty of our parks without it driving up the cost of our water? Categories: Miscellaneous | Tags: fallkill falls, prospect park, prospect park alliance | Permalink.